When Lily Wong was in the third grade, she remembers falling in love with horses while learning how to ride at a local stable. The instructor encouraged her to get involved with caring for wild horses. More than eight years later, Wong is doing just that with the help of her mentor. 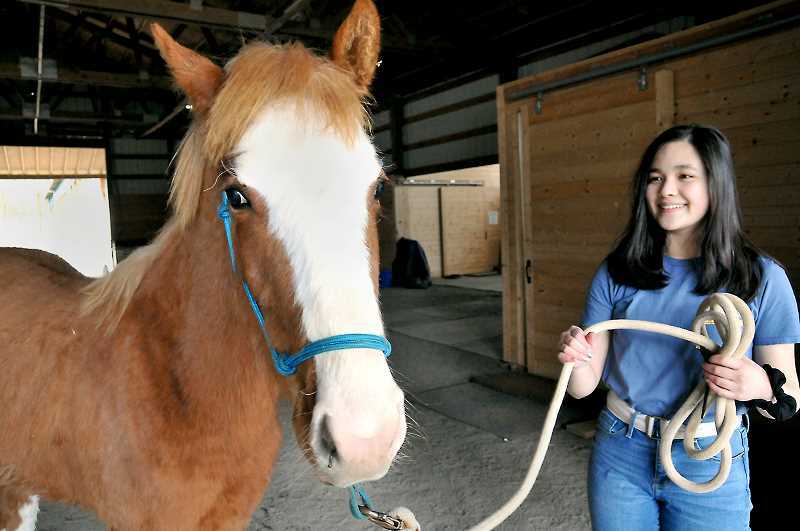 Wong – a junior at Newberg High School – is part of the Teens & Oregon Mustangs program that rescues wild mustangs from eastern Oregon and adopts them out to members of the agricultural community throughout the state. 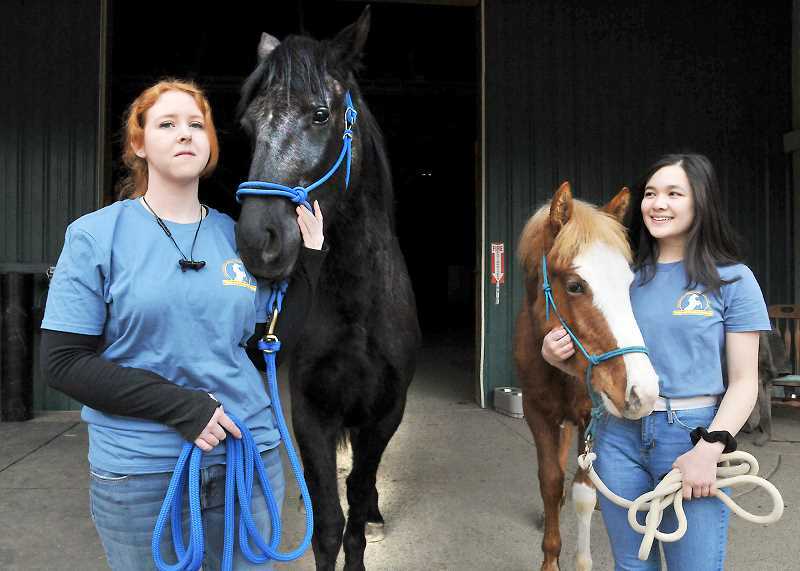 The teens – guided by their mentor, often a person with extensive experience handling horses and other livestock – are tasked with gentling the horses and preparing them for adoption over a three-month span. Due to overpopulation and a lack of natural predators, among other factors, many of the horses would otherwise die of starvation or disease were it not for the program. After the teens' and mentors' work is done, the horses are adopted out at a 100 percent rate, according to the program's website. Alyssa Huntley is Wong's mentor and has been involved with Teens & Oregon Mustangs for roughly five years. Standing outside a barn at Corral Creek Stables on Parrett Mountain, she and Wong keep hold of the reins and provide a pair of horses with reassuring pets on the muzzle. "She's really sweet, even by baby standards," Wong said of her horse, Curiosity. "She is one of the more gentle ones." Curiosity is an 8-month-old filly with copper hair and a white stripe down the center of her face. Huntley's horse, named Opportunity, is around 2 years old with jet black, patchy hair and visible scarring across her neck and back. Opportunity peels back her lips and shows off a smile when offered a cookie. Many of the horses in the program enter care in rough shape. Wong and Huntley picked up these and other horses from the St. Paul rodeo grounds after they were transferred from a jam-packed holding facility in Burns. "When she arrived she was severely emaciated," Huntley said, patting Opportunity on the shoulder. "They had just been rounded up and a lot of them were nursing foals at the time. Trying to feed a baby on land that can't support the horses just leads to starving horses." The Bureau of Land Management and the Mustang Heritage Foundation operate and support programs throughout the country that try to limit wild horse populations for the benefit of the individual horses. Try is the operative word, though, as many herds continue growing at rates faster than the government and organizations can keep up with. The BLM announced last week that it is offering $1,000 to adopt an untrained wild horse or burro. The promotion is part of a larger movement across states like Oregon, which has roughly 10 percent of the national population of wild horses. A horse's journey through programs like Teens & Oregon Mustangs begins when the BLM rounds them up and captures them from the wild. They are promptly vaccinated, tested for diseases and held at facilities like the one at Burns before either being adopted out or sent to people like Huntley and Wong. Those facilities are often overflowing with horses and many of the animals aren't quite ready to be adopted – whether it be for health or temperamental reasons. The Thoroughbred Incentive Program (TIP) is a separate program that pays trainers like Huntley to gentle horses and get them ready for adoption. Wong's involvement in Teens & Oregon Mustangs is something of a renewed passion for her. She loved horses growing up and found her chance to return to that interest when Corral Creek Stables opened up. Through the program, she said she has found a calling that she hopes turns into a career when she is older. "It's been a really good experience," she said. "You learn a lot and get to be around these beautiful horses. Who wouldn't want to do something like this?" For more information on the program, visit www.teensandoregonmustangs.org. Further details on the federal adoption program are available at www.blm.gov/adoptahorse/.